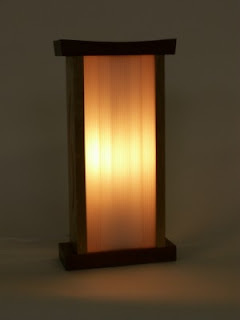 Description of Lantern: Shoji - the modern term for translucent paper doors or windows - was the inspiration behind this lantern upon finding a piece of corrugated plastic in a curbside throw away. The side cutouts originated with two free-hand pencil lines that were then transcribed and cut allowing just a hint of light to sneak out of the sides. The slightly curved and beveled top help to frame the gentle glow of the Shoji. A hand rubbed wax finish over oil and polyurethane was applied bringing out the beautiful grain contrasts of the red oak sides and Spanish cedar top and bottom. 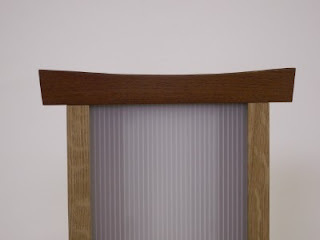 The white birch lantern features mortise and tenon joinery, pyramid plugs and chamfered edges with a finish of clear lacquer and wax. All wood and glass (and the top 2 screws) have been recycled from the old Lincoln Foods building in Lawrence Massachusetts.